The One World Drum Co. has been using the drum in Calgary and surrounding area for over 20 years. From workshops at local schools to large corporations from city wide festivals to small performances at community centers Roger has inspired people to play the drum, be part of community and think outside the box. One World is your one stop Rhythm and Sound Emporium. We sell hand percussion, didgeridoos and other items, we teach classes, school residencies and team building sessions, and we have a performance troupe. Most people just say "they don't want to work they just want to bang on their drum all day!" We give you the opportunity to do just that - come bang on our drums! Be the first to review The One World Drum Co. Traditionally African drums were used to celebrate all aspects of life: weddings, births, deaths, hunting, harvest, a call to gather as a community. 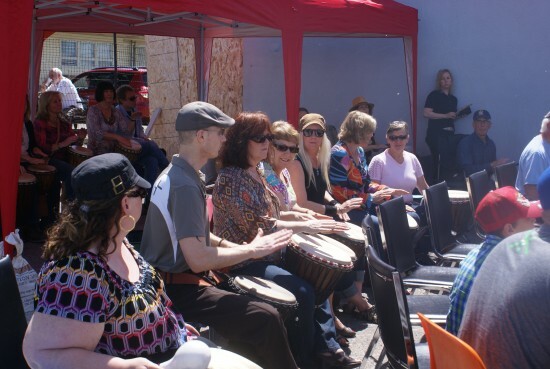 Our drumming events support a world beat in a community where everyone’s voice is important, and where everyone has fun! Each person will have a drum and a chair within the circle. Our facilitator will be there to keep the circle alive and the rhythm flowing. Team Building involves many aspects of teamwork such as, communication, leadership, feedback, specialization, trust and passion, as well as learning how to hit the drum, the history, language and a rhythm in 2-3 parts. Workshops are a basic class where you learn history, language and a rhythm In 2-3 parts, without the added team building information. Drum circle, while teaching a bit about the drum is all about fun and the bonding experience of the circle. 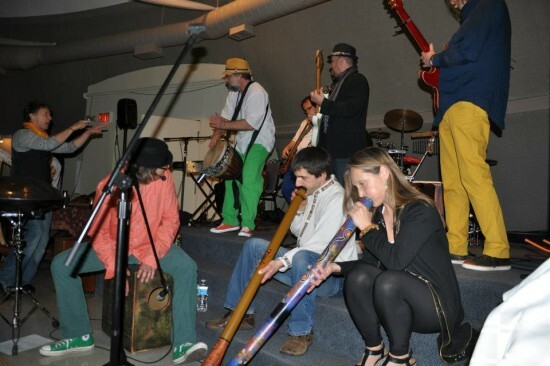 At a drum circle 50% of the instruments are drums and 50% other percussion instruments. Performance - the OWD house band can make any event a success! With a professional group of musicians the OWD house band can offer an accoustic drum set or they can offer the full world beat show with guitar, keyboards and kit. In special locations the OWD house band can also offer the most amazing projection show that is synched to the drumming. One World Drum Co is a lively group of dedicated musicians who perform traditional West African music that is enriching to our society, fosters growth, healing and a sense of gathering. 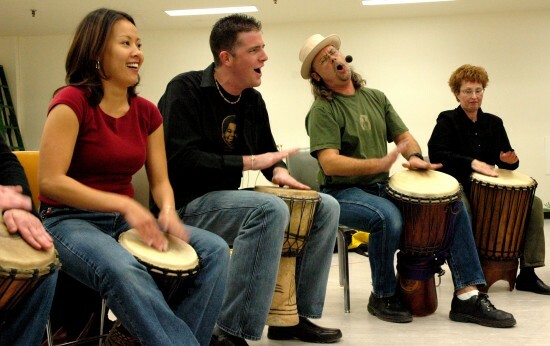 By using the sounds of the West African hand drum, called a Djembe; this group infuses rhythm and voice to convey the enchanting sounds of Africa to schools, community groups, festivals, and other various events across Central Alberta. Each member contributes a unique gift and talent to the dynamics of this extraordinary group: to see them live is always an uplifting experience. This year the One World Drum Co celebrates their twentieth year of performing and traveling as a professional group. Through the means of time, precision, and enthusiastic energy, the One World Drum Co have created events that is uniquely their own, and have set a precedent that has echoed as the foundation for the growing interest of Global music throughout Calgary. The One World Drum Co. recorded an album entitled Ubuntu. The title pertains to the unending knowledge of becoming more human and experiencing growth in our lives through each other. We are all on a journey, and can identify with the call within the self to stretch and become more of who we are through our family, friends, and community that enriches our human spirit. Drumming is fantastic as it can be as simple as walking into a circle with your drum and strapping it on and playing. It can be used in a small setting or it can be used on large stages. The possibilities are endless. Each drum event is tailor made to meet the needs of the client. The father of drumming - Babatunde Olatunji!